Computer LCD motorized lift is a new design of electrical lifting monitor mechanism with screen tilting function. It’s a hidden equipment for audio video conference system. LCD/LED monitor could arising up to the tabletop if user would to present information by wireless controller. 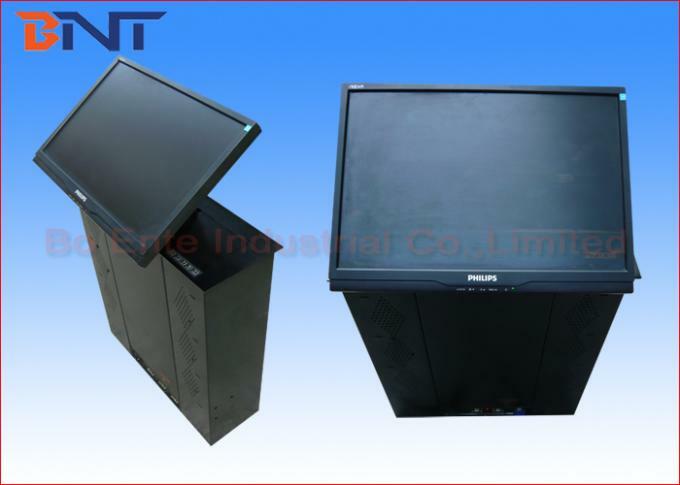 And the LCD/LED monitor would be tilting 45~60 degree for prefect presentation automatically once arrived the desktop socket. LCD/LED monitor would moving back from 60 degree position and coming down into the mechanism case if user finished meeting. LCD motorized lift featured by stable performance, automatic operation & space saving. 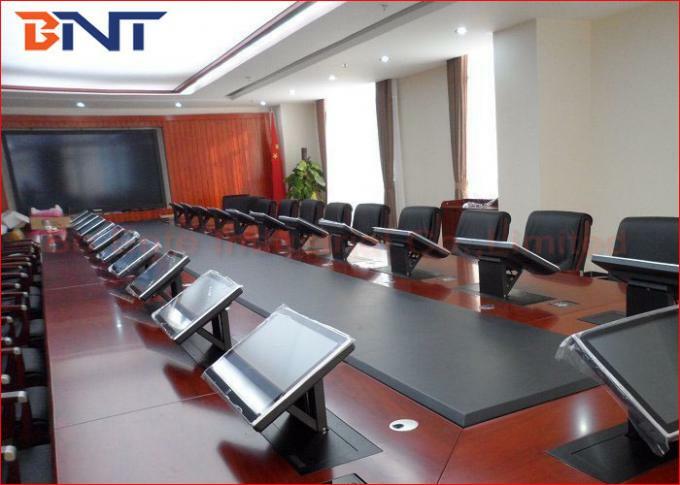 With its smart function, it provides an efficient manner and enjoyable experience in conference communication and information presentation for meeting. 1, Made of aluminum alloy panel and steel case, adopt imported circuit board, synchronous motor,and gear & rack. 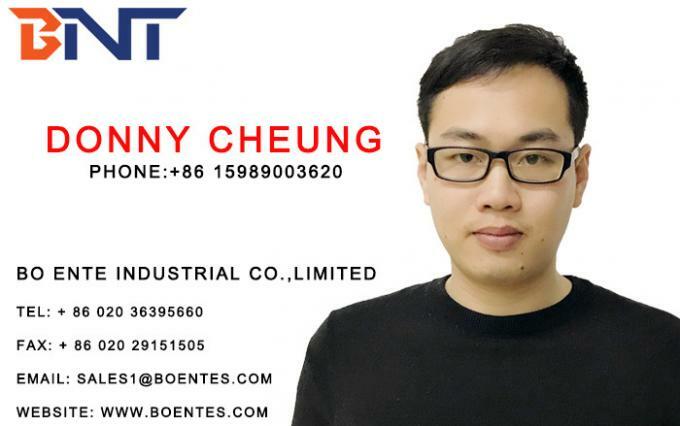 3, Adopt double powerful motor, one motor to control monitor lifting up and down from mechanism, another motor control monitor tilting 45~60 degree angle and back. 4, Smart circuit board offer monitor protection, monitor could be power on once arrived the desktop, monitor could be power off if reach the bottom automatically. 6, Provide screen angel adjustable button, 45~60 degree screen to offer prefect reading area for information presentation. 7, Working smoothly and quietly during operation. Low noise which less than 30db. 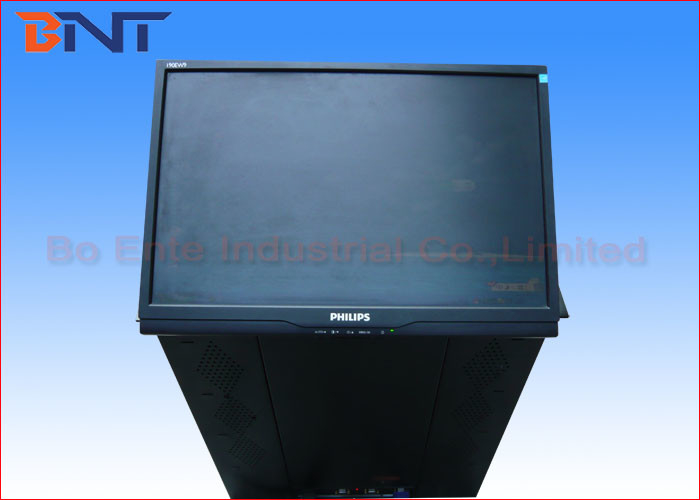 1, Screen could be electrical overturn 45~60 degree angle for more prefect presentation. 2, Aluminum black or silver color are available for normal selection, aluminum gold color could be customized if required. 4, Provide professional user’s manual and cable connection layout for installation. 5, Packed with strong carton with foam cushion to protect product during transportation. Wood box or wood support is available if required.